Dr Graeme General Purpose Massagers are used at Chiro Adelaide and are a great addition to Chiropractic treatments. Typically used at the beginning of treatments (or where clinically indicated), these devices have been clinically proven to aid in the promotion of healing and reduction of pain. A variety of attachments can be added to he massager and used to help in the relief of certain muscular tension, musculo-skeletal conditions and more (as mentioned above). 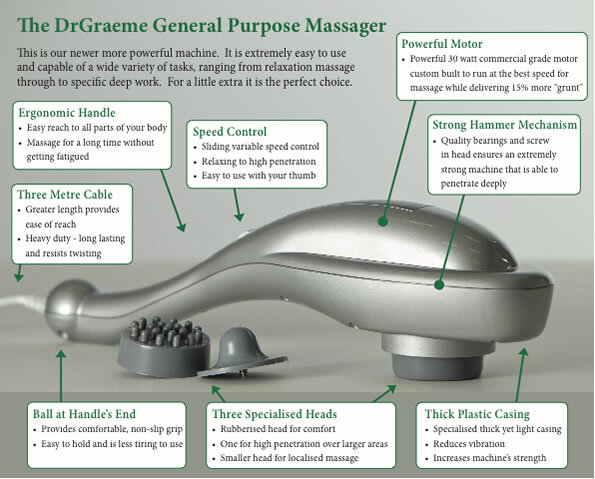 Dr Graeme massagers can be ordered from our clinic and used at home. An instruction manual is included, providing indications for safe operation of use. If you would like to learn more about Dr Graeme Massagers, click here. Alternatively, call Chiro Adelaide on 8231 0600 to find out more and order one of your very own to use at home! !